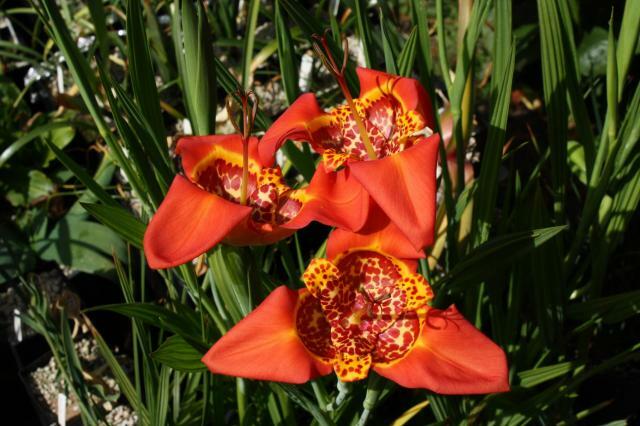 Tigridia is a genus of about 30 species mainly from Mexico and Guatemala. 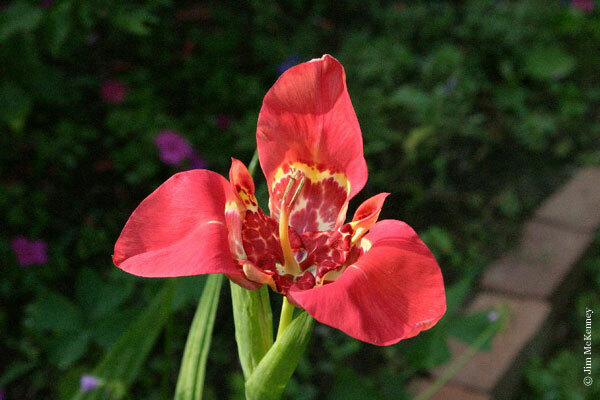 They produce a succession of short lived flowers which are usually in bright colours. 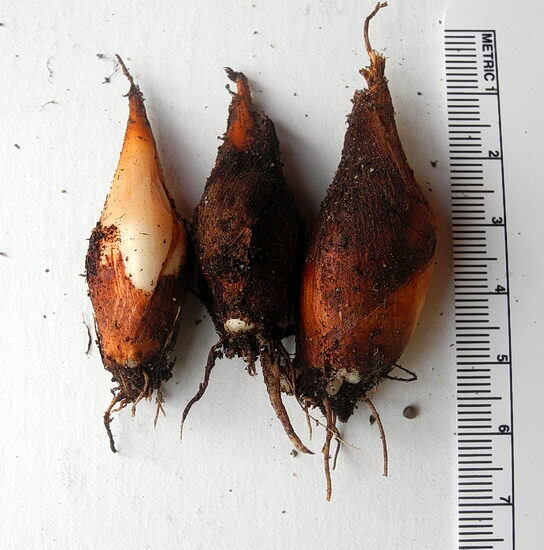 The rootstock is a tunicated bulb, found from 3 to 15 cm deep in the wild. Bulbs are never found to offset in the wild. Leaves are pleated in a broad fan. 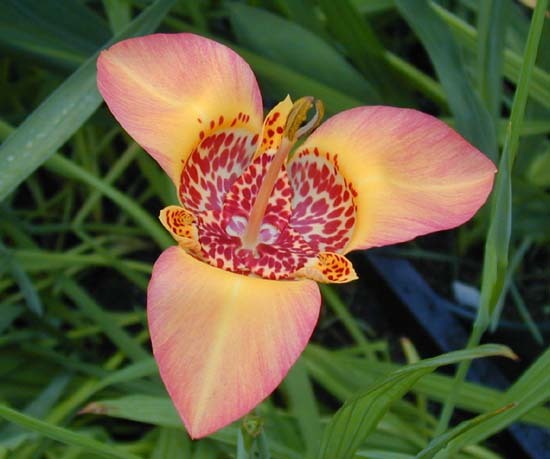 The best known species is Tigridia pavonia whose flowers are 10-15 cm (4 -6 inches) across in red, orange, yellow or white variously blotched in the centre. They commence growth in spring and generally die back during autumn. 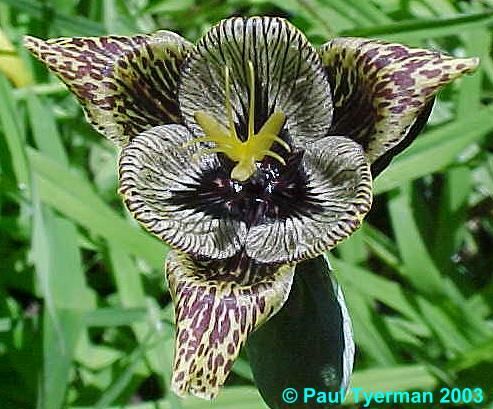 This genus was the subject of the topic of the week September 2003. An introduction was furnished by Alberto Castillo. 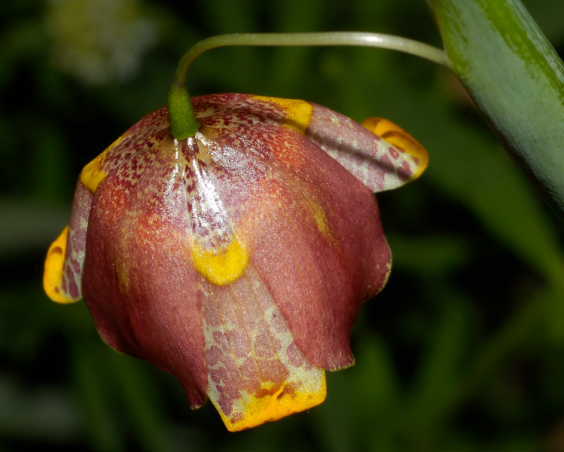 In their 2008 book, The Iris Family: Natural History and Classification, Peter Goldblatt and John Manning included the four species of Rigidella that differed only in having a minute outer segment. They viewed this as merely an adaptation for hummingbird pollination. 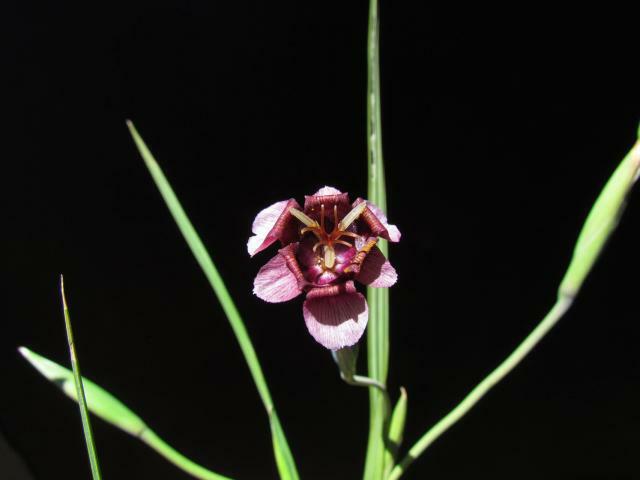 Also included were one of the species in the genus Colima and the genus Sessilanthera. Tigridia mariaetrinitatis Espejo & López-Ferrari is found only in its type locality in Oaxaca State, Mexico. 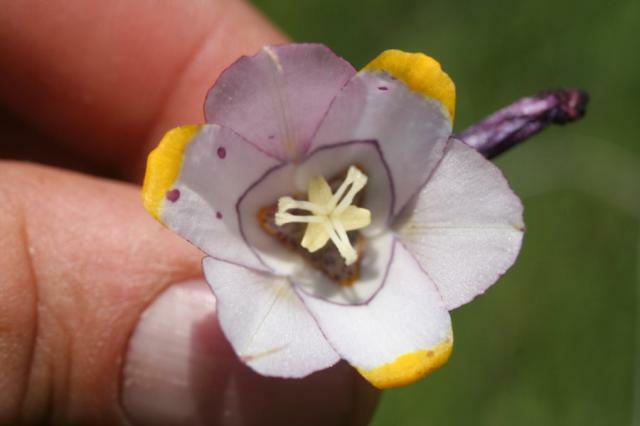 This species has erect flowers with lilac outer tepals with purple spots, yellow inner tepals with purple spots and a yellow base. It occurs in seasonally flooded plains at 2380-2520 m. More detailed information can be found here. 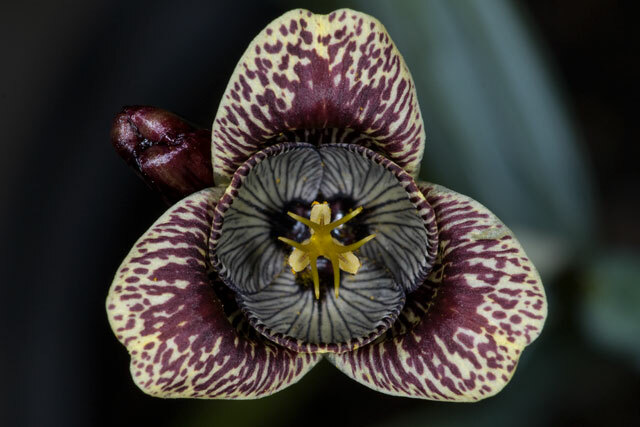 Tigridia matudae is an extremely rare alpine species from Mexico, reported from only two localities in Mexico and Morelos States. However, the original type locality was searched a few years back and no plants were found, so it is possible that it exists only at one locality at present. 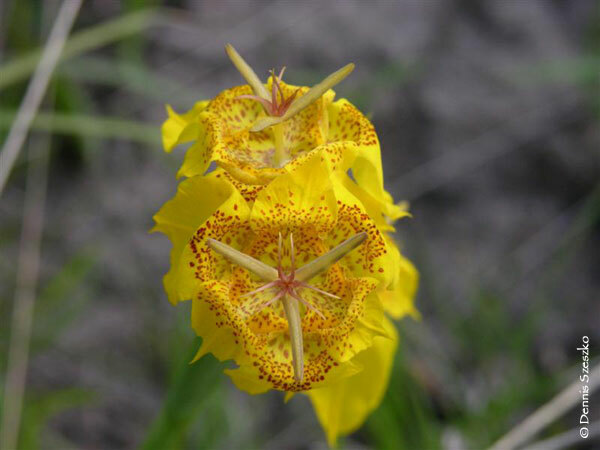 The plant seen in the pictures was photographed within the boundaries of the Zempoala Lakes National Park that straddles the border between Mexico State and Morelos. Elevation is 2900-3000 meters above sea level in cold, damp conditions. Yearly average temperatures are between 5 to 12 °C with frequent rains including during the "dry" season. The plants grow in the shady understory beneath Pinus and Abies trees. 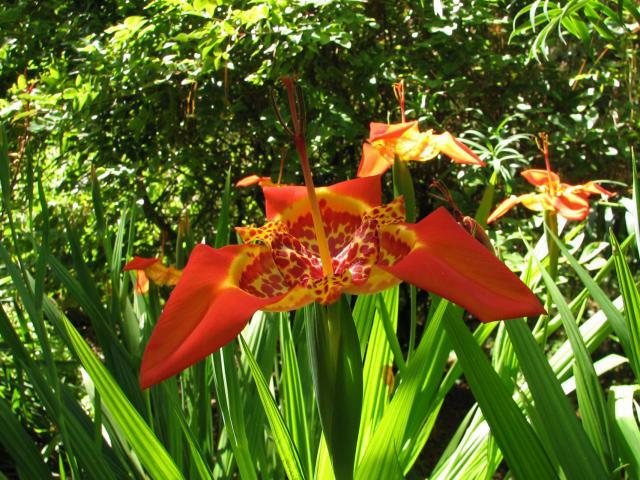 The plant is rather tall in comparison to other members of the genus and can be 60-85 cm in length with two cauline leaves that are relatively narrow. 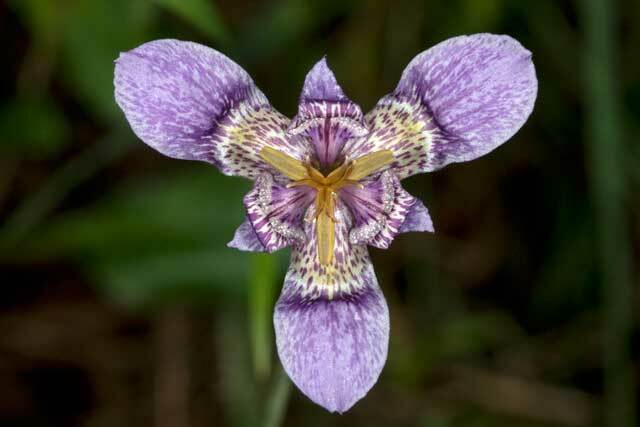 The stunning flowers appear bluish in photographs, but are actually a pale lilac when seen in person. 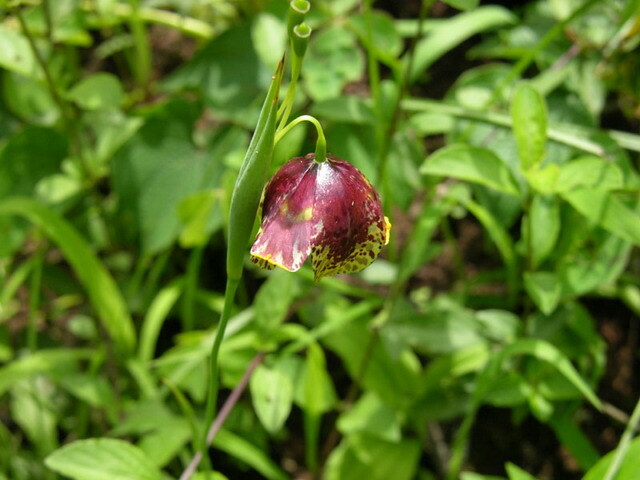 Flowers appear from August-September and are rather large for the genus (3 cm in diameter). The specific epithet honors a noted Japanese botanist, Eizi Matuda, whose most noteworthy contribution to Mexican botany was a comprehensive flora of Mexico State. 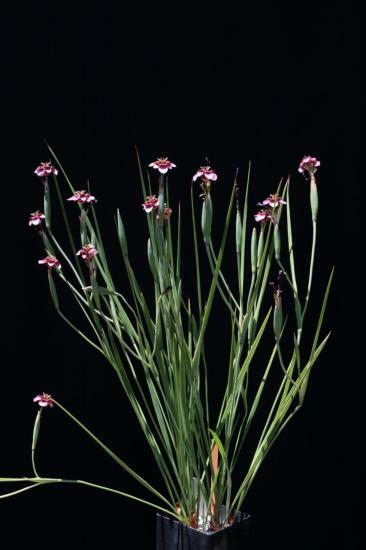 Photos by Dennis Szeszko of a plant photographed in situ August 14. Tigridia meleagris is a common Mexican species and I have seen it out in the field far more often than I've seen some of its cousins. 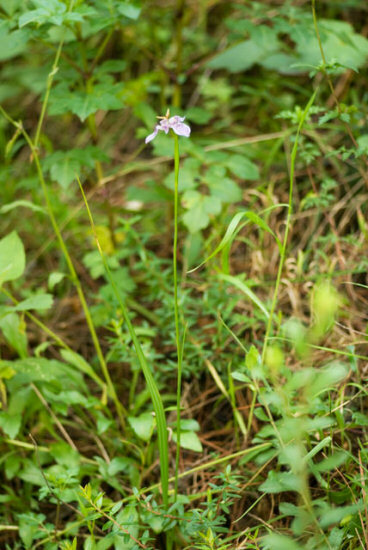 Unfortunately, the plant is very spindly and difficult to spot. 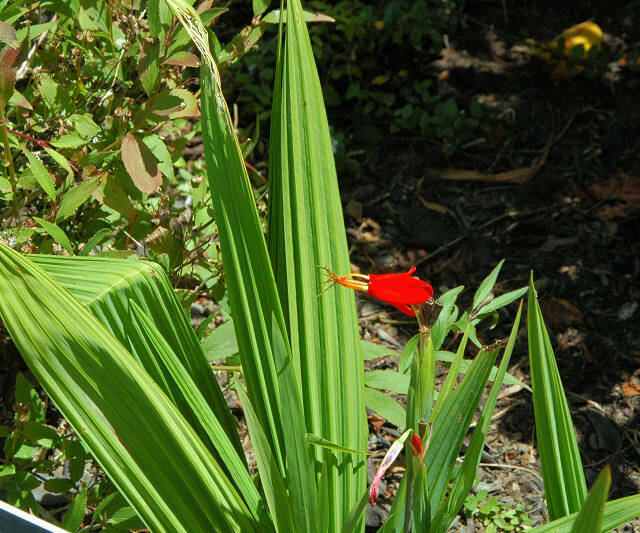 There is usually one solitary, narrow, pleated leaf up to 35 cm in length on top of a stiff, wiry stem. 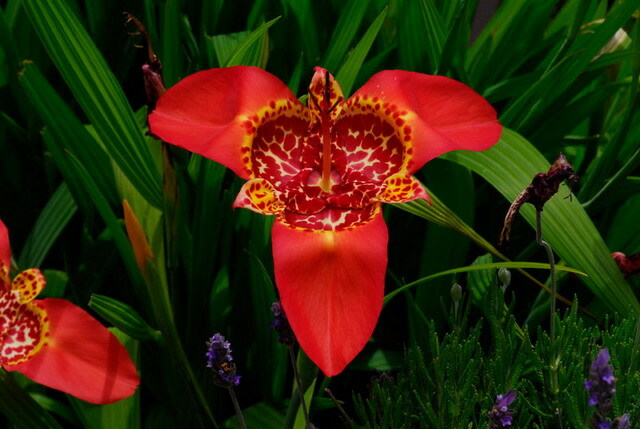 It grows in deciduous jungle habitat 1000-1500 meters above sea level that has very pronounced rainy and dry seasons. 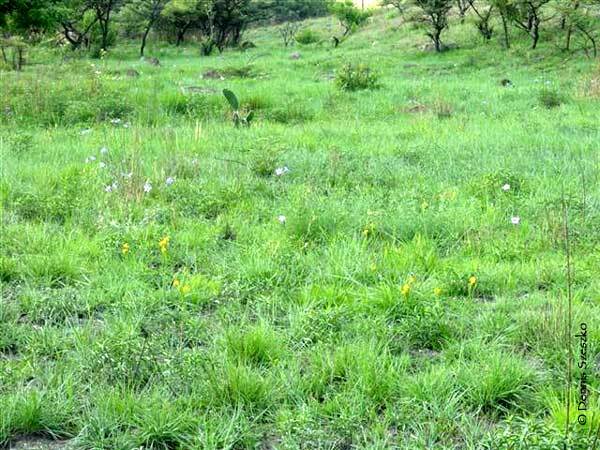 During the rainy season this habitat is very lush and full of an exuberance of vegetation of all kinds. Consequently, this species tends to be be tall in order to grow higher than the other plants that tend to crowd it out where it grows. 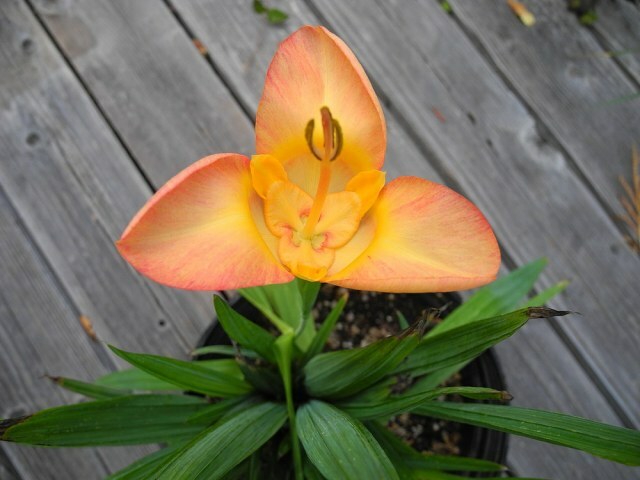 I have found this species difficult to cultivate because the potting medium needs to be bone-dry in the dry season to prevent the bulbs from rotting. 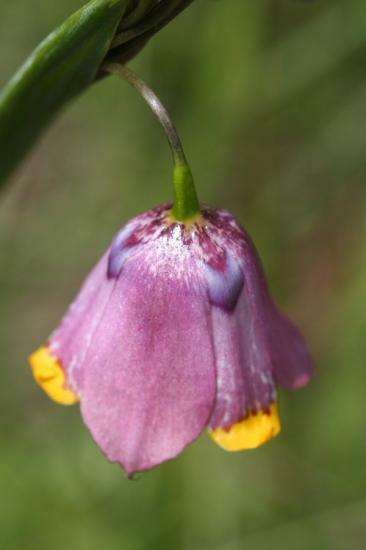 The bulbs of this plant in the wild are difficult to extract from the ground without damaging them because they extend down into the soil up to 30 cm deep and like growing in pockets of soil among rocks. 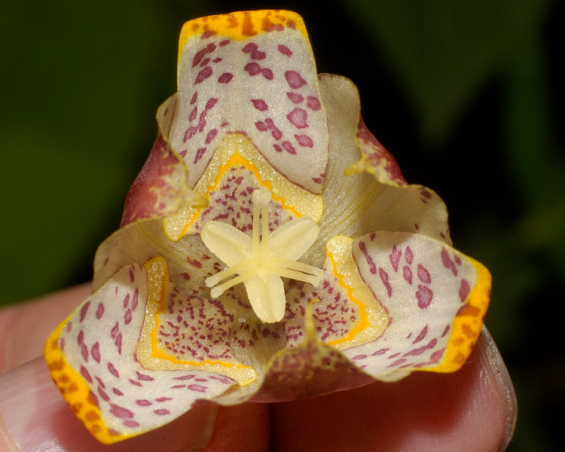 Unlike most other species of Tigridia, the flowers of this species are pendulous and are not held erect. I have never found this species to offset in the wild and it reproduces exclusively by seed. It flowers from July-September in its natural habitat. 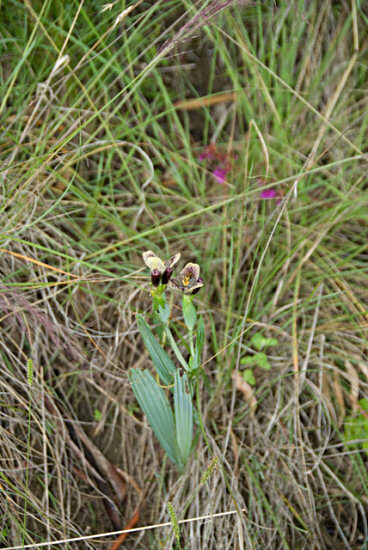 Photos 1,2,3 by Dennis Szeszko of a plant photographed in the month of August in situ in Mexico State near the border with Michoacan. 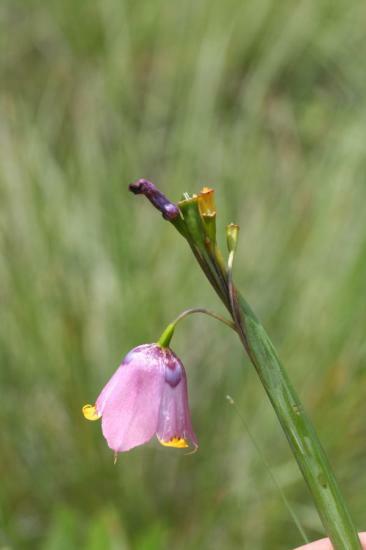 The last two photos are of interior and and side views of the flowers in situ. Photos 4,5,6 were taken by Dale Denham-Logsdon in early August from El Divisidero which is just north of Ixtapan de la Sal, Estado de Mexico. 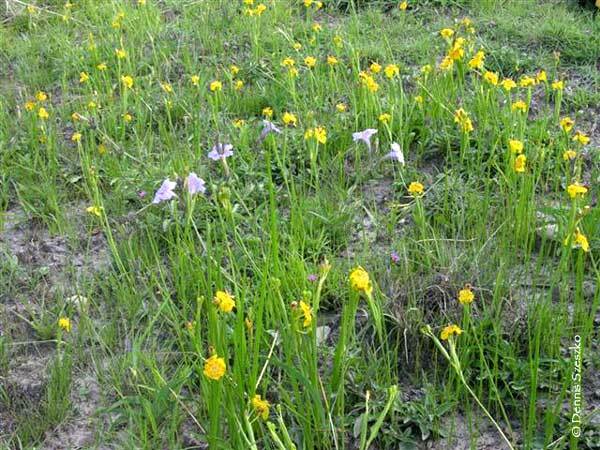 Plants were growing in a road cut beneath a power line in a rocky soil at an altitude of about 1825 meters. 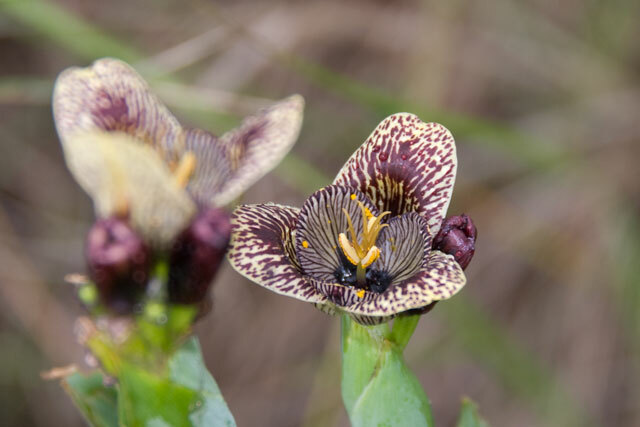 Pictures of Tigridia meleagris taken by Ignacio Torres Garcia at Jesús del Monte, south of Morelia, Michoacán at 2100 metres on the 10th July, 2015. Differences in coloration are commonly seen in disjunct populations in this genus. 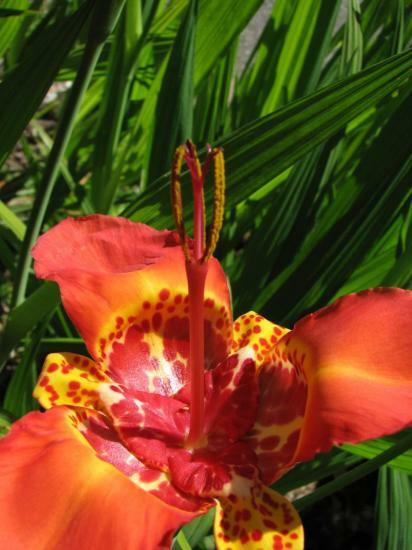 Tigridia mexicana is native to parts of Mexico with pronounced rainy and dry seasons. 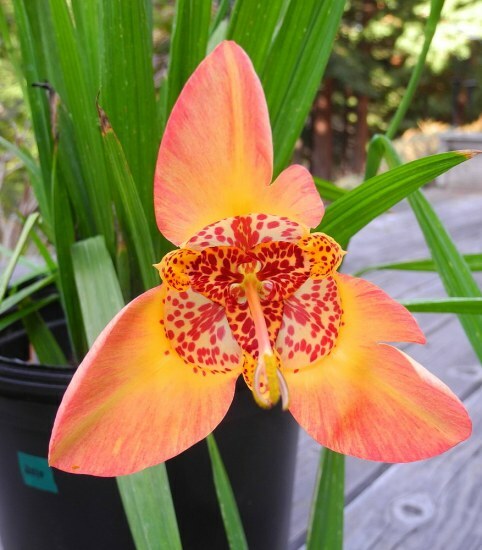 It grows in clay pans subject to seasonal flooding in full sun at an altitude of around 1750 meters in the transition zone between oak forest and deciduous brush jungle. 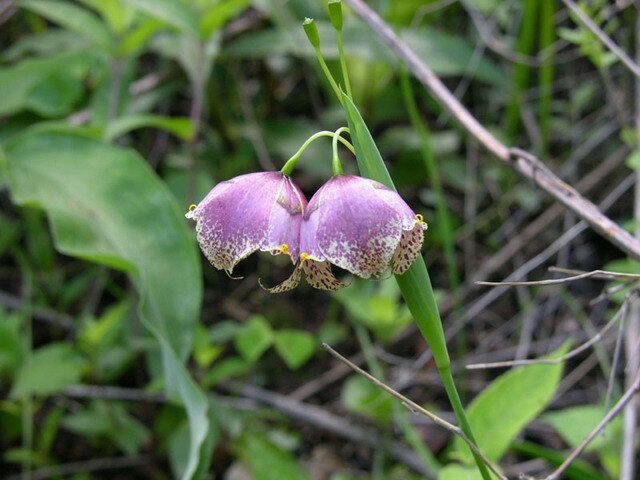 It flowers at the beginning of the rainy season in its native habitat (end of May through beginning of June). 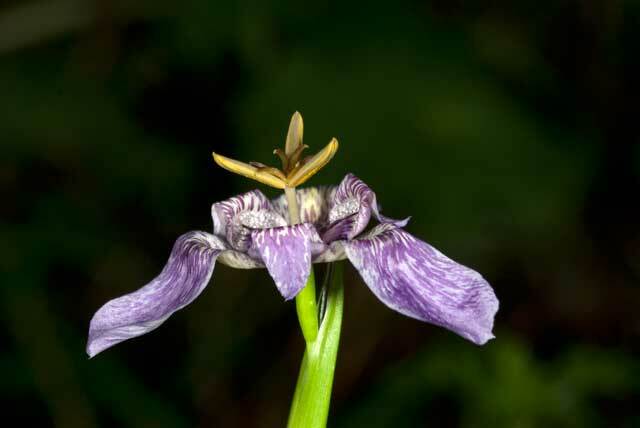 The flowers appear at the top of a 8-10 inch tall inflorescence before the pleated leaves have fully extended. 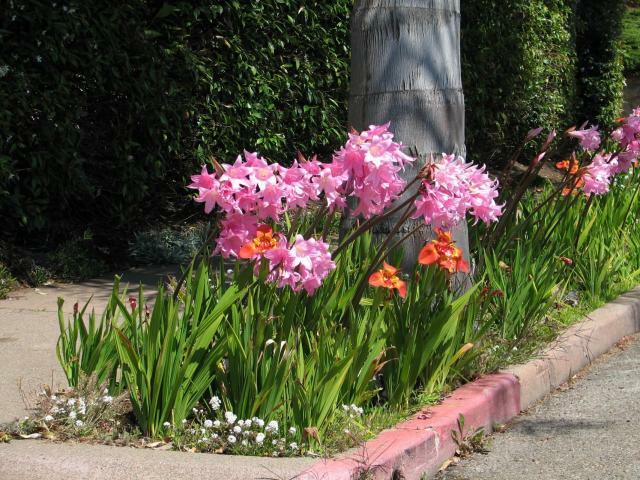 The bulbs grow deep about 8-10 inches under the compacted soil and are difficult to dig up without damaging the bulbs. 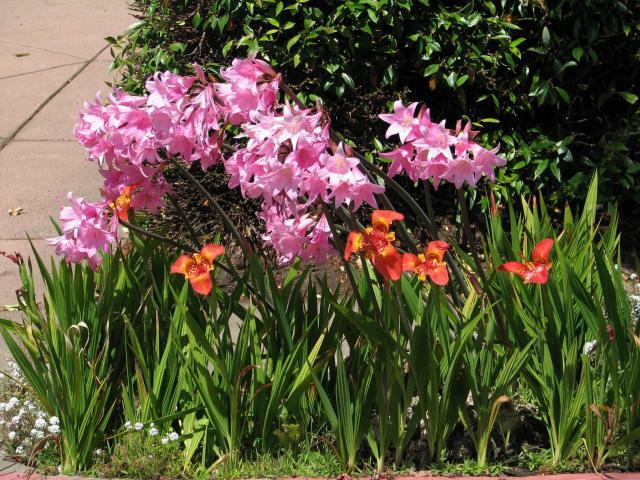 The bulbs do not offset but grow quickly and easily from seed. 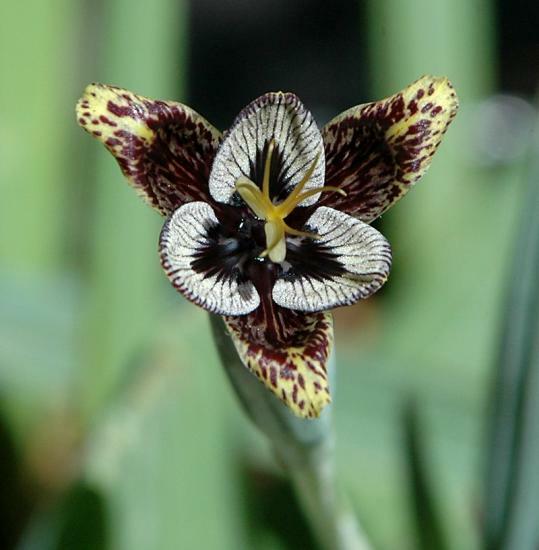 Tigridia mexicana is thought of as consisting of 3 subspecies, differing in flower color but mostly identical in vegetative morphology and habitat preference. 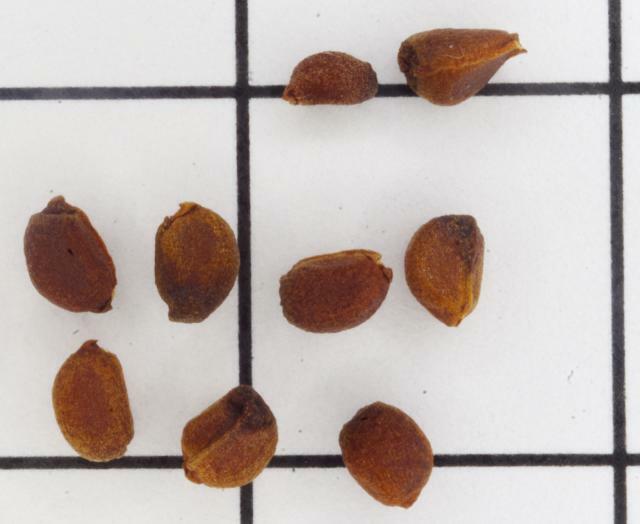 Since mixed populations do not occur, and Molseed found that hybridization between them was difficult, further genetic studies may or may not confirm the subspecies status. 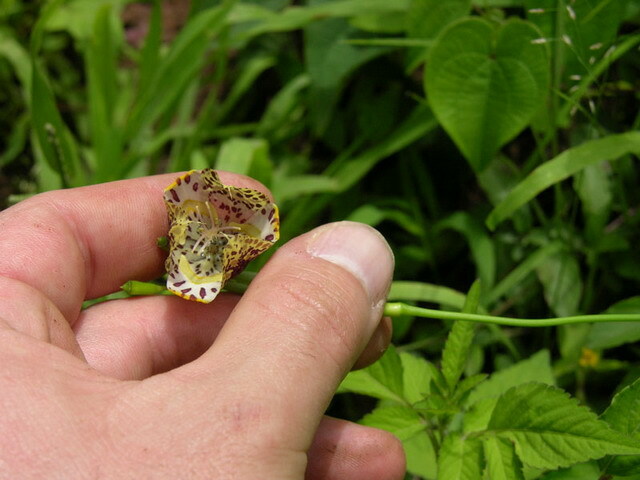 Tigridia mexicana subsp. 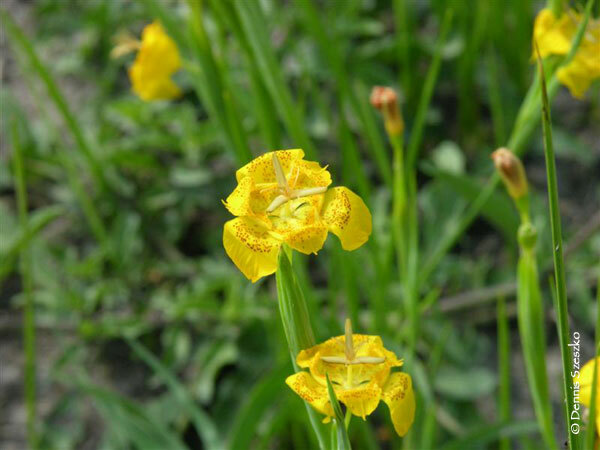 mexicana, the yellow form, was seen growing near Sprekelia formosissima, Milla biflora, Sacoila lanceolatus (terrestrial orchid), Sisyrinchium sp., and Echeandia sp. 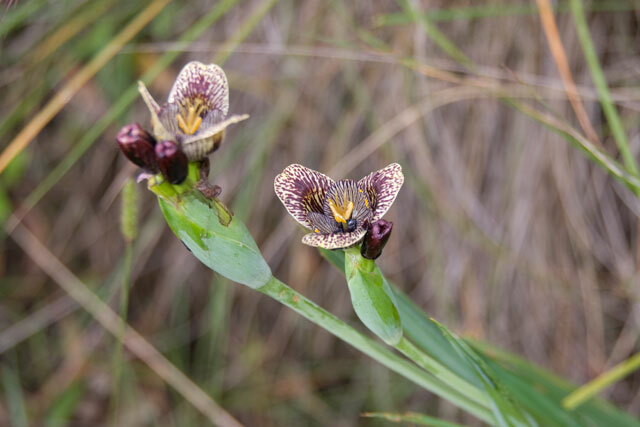 These other geophytic species were observed growing in rocky areas at the edges of the areas prone to flooding where Tigridia mexicana grows. 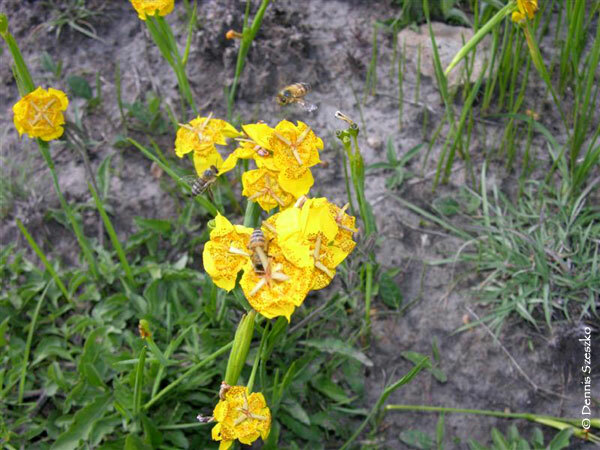 The first two pictures were of cultivated plants. The remainder of the photos were taken in situ in Mexico State. 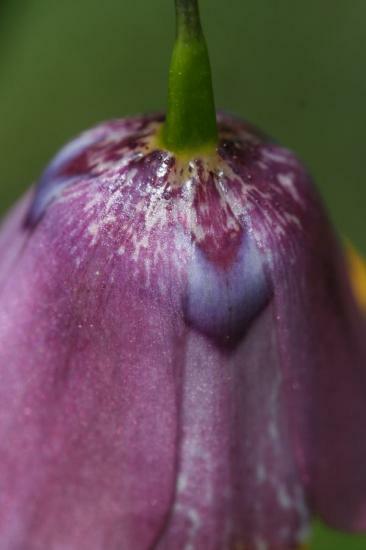 Photos by Dennis Szeszko show flower closeups (top view, side view) from cultivated plant and flowers being pollinated by honeybees (Note clay soil and just emerging leaves) and close-up of flower in situ. Small colony of Tigridia mexicana in situ with Ruellia sp. (purple flowers) in the first photo and wide-angle view of habitat showing Opuntia sp. and scrub-brush in the second. (Note little yellow flowers.) Photos by Dennis Szeszko. 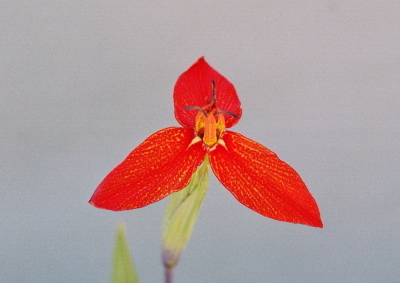 The other color forms are Tigridia mexicana subsp. lilacina with purplish flowers and Tigridia mexicana subsp. passiflora flowering white. 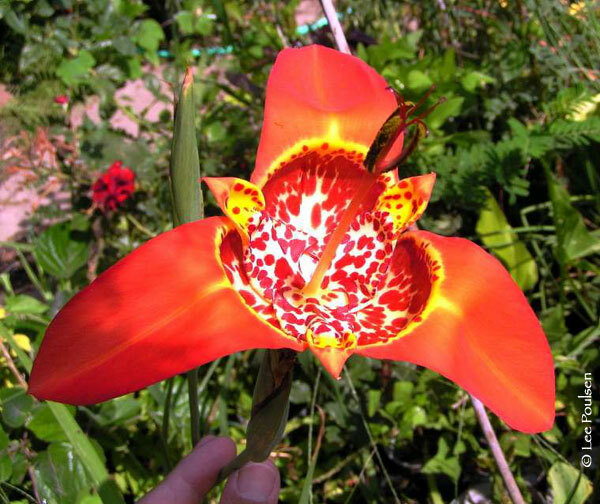 Tigridia multiflora has a broad distribution in Mexico from Chihuahua and Nuevo León south to Oaxaca State. 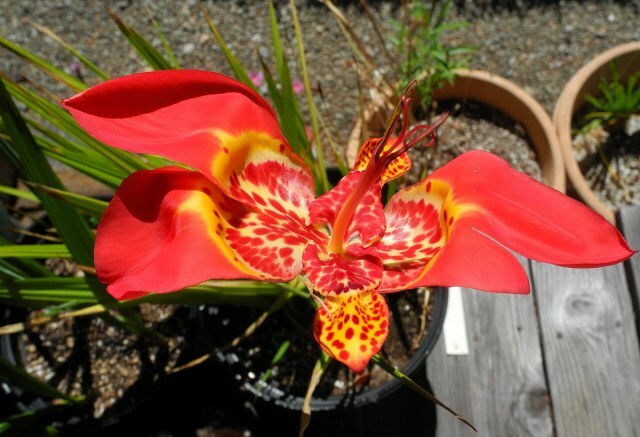 This species can be grown like T. pavonia. In dry summer climates, it tends to be a magnet for mites. Photo 1 was taken by Paul Tyerman. Photos 2-6 were taken by Nhu Nguyen, showing the closeup of the flowers and the potential for many flowers to bloom at the same time. Tigridia orthantha (syn. 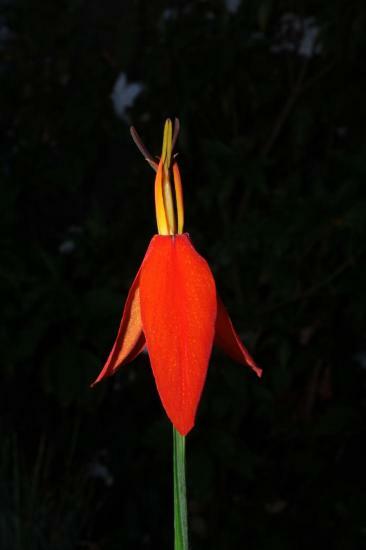 Rigidella orthantha) is a cloud forest plant from Guatemala and Mexico. 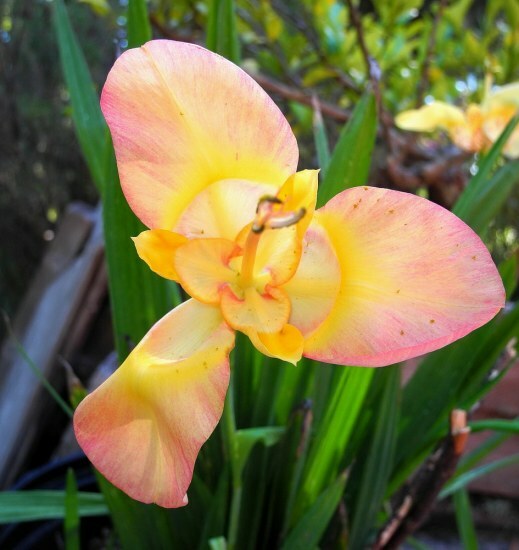 It is found in higher altitudes in areas with cooler and moist pockets of air year round. 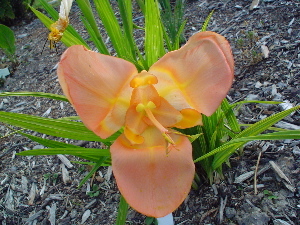 Because of this distribution, it is difficult to grow this species where the temperature gets too warm during the day. 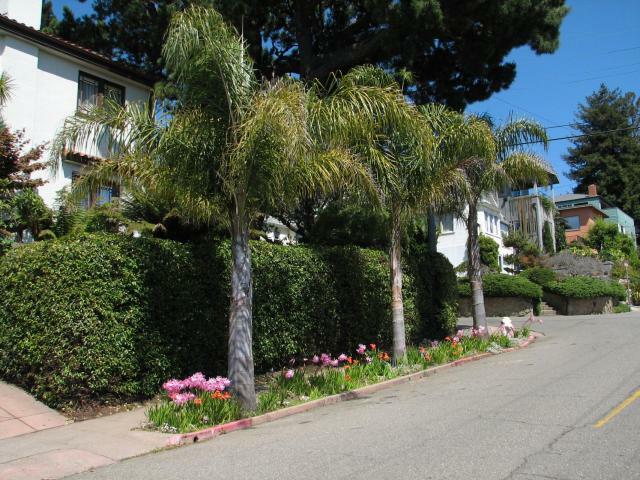 It does very well in the San Francisco Bay Area where it can even be kept outdoors during the winter where it will go into a semi-dormant state with yellowing leaves and may not drop those leaves until spring arrives. 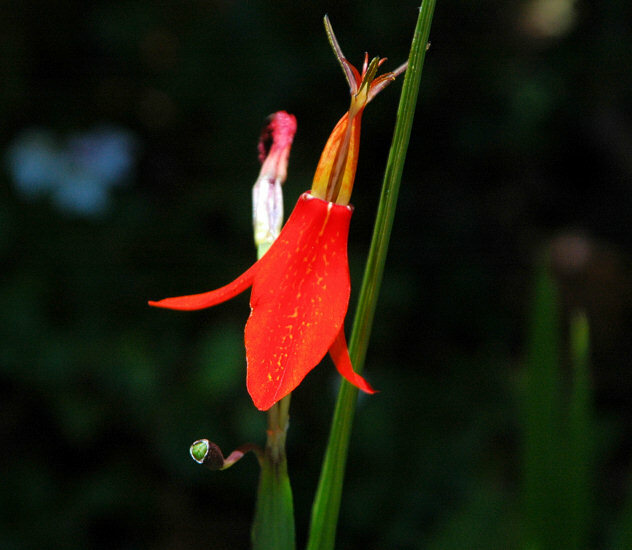 Seedlings sown in June (summer) and allowed to remain moist in winter can bloom the following summer. Photo 1 is from Rob Hamilton. 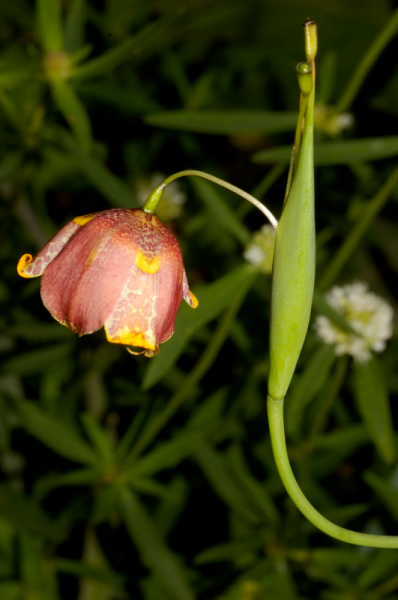 Photo 2 was taken by Mary Sue Ittner in June 2007 of plants growing in the Mendocino Coast Botanical Gardens. The photos below were taken by Nhu Nguyen. These plants came from wild-collected seeds and thus have very nice variation between each plant. Photo 1 shows a pot of seedlings about 6 months old. Photo 2 shows flowers from one clone, and photos 3-4 show flowers from another clone. 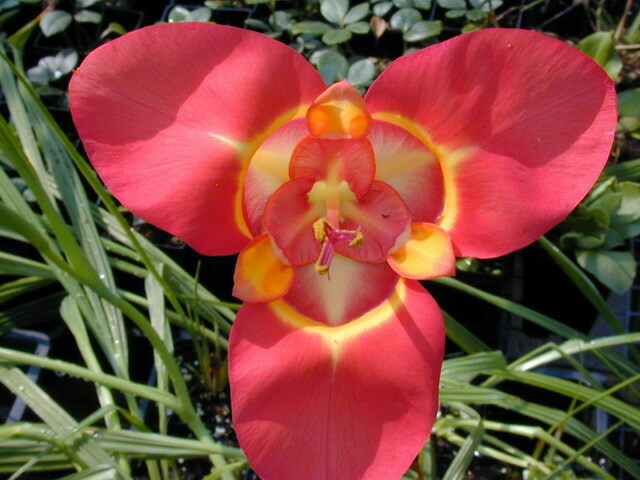 Tigridia pavonia is native to Mexico where it grows in semitropical to semialpine climates. 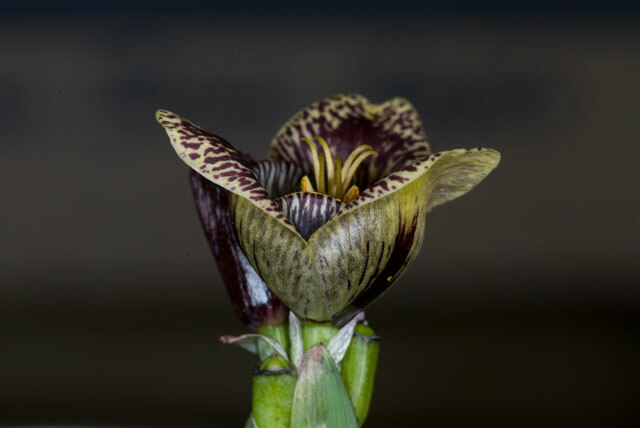 The true origin is somewhat obscure since they have been cultivated by the Aztecs for their edible bulbs and easily escape from cultivation in suitable climates. Plants can be grown easily from seeds. Sow the seeds in well-drained medium and keep the pot moist in a warm area. If the temperature is too cold the seeds won't sprout well. 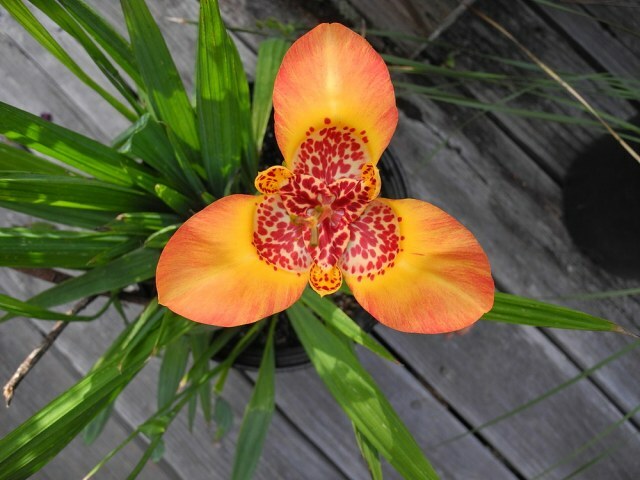 If started inside, strong seedlings may flower first year from seed under ideal conditions, though most will need a second season. The seedlings may profit from division as ones that are kept crowded together do not grow as fast. These plants will need a dry winter dormancy and are tolerant to lifting and dry storage even as young plants. 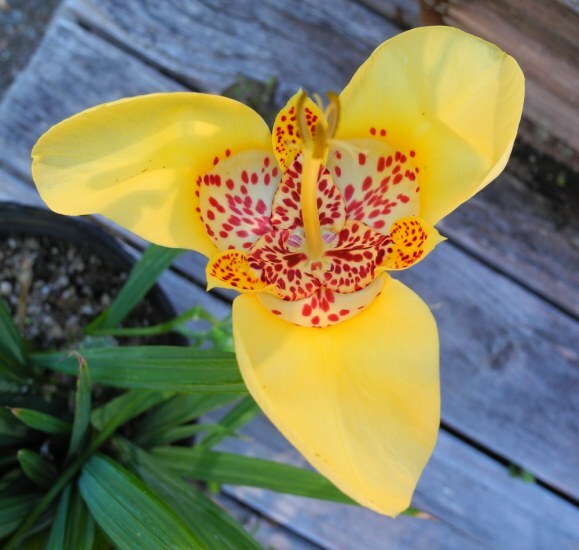 Actively growing plants benefit from fertilizers and regular watering. 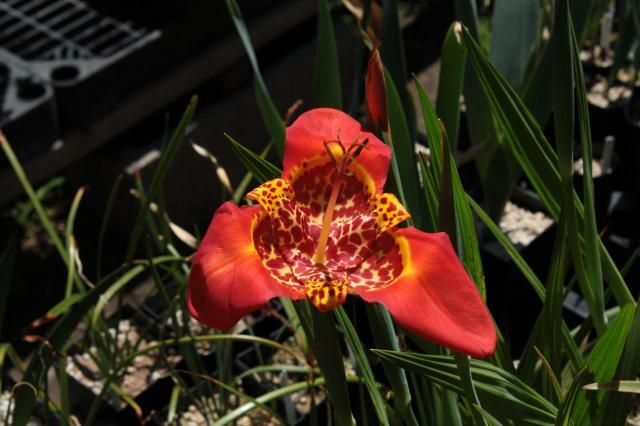 These four photos demonstrate some of the color variations found in flowers of Tigridia pavonia grown from one collection of seeds harvested from wild plants. 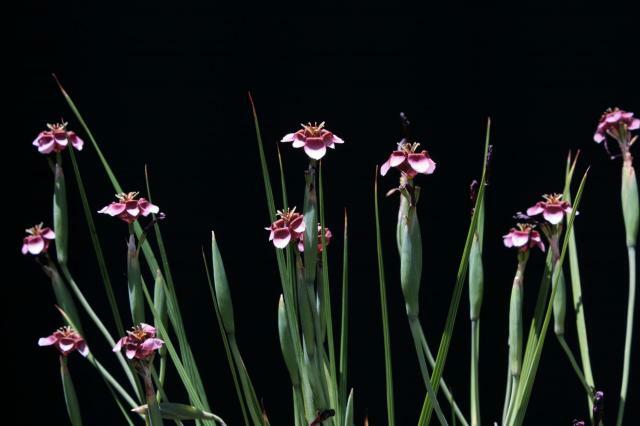 These plants flowered only two years after sowing the seeds. Photos by Dennis Szeszko. 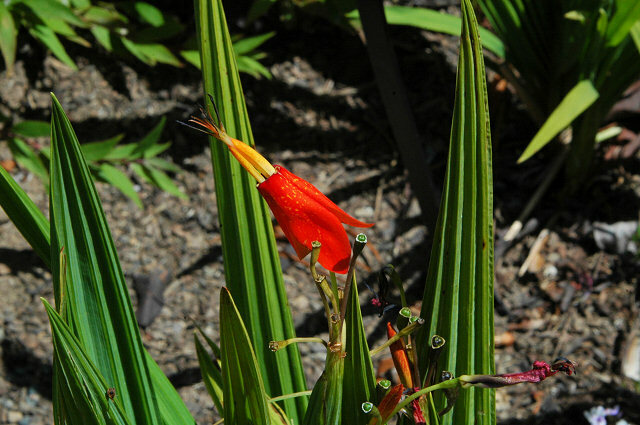 Photo 1 below is a red form taken by Lee Poulsen Sept. 2003, from a collection made by Yucca Do (#T73-33) at a much lower, and hotter, elevation than what they claim the typical form the Dutch have propagated was collected from. It may be true since none of the Dutch ones survive at their nursery located in Central Texas; this one does, and multiplies well. It is very large, ~6 inches (15 cm) across. Photos 2-3 were taken by Nhu Nguyen of plants from a nice clump in the ground at the UC Botanical Garden. They get winter rain but persist regardless. 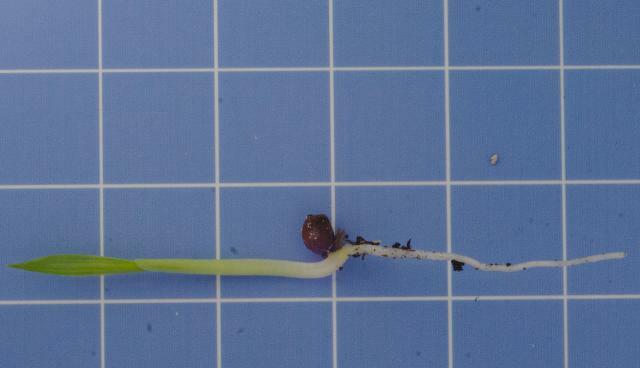 Photographs 4 and 5 by David Pilling show seed and a seedling about 28 days after the seed was exposed to moisture at 65°F; both on a 10 mm grid. 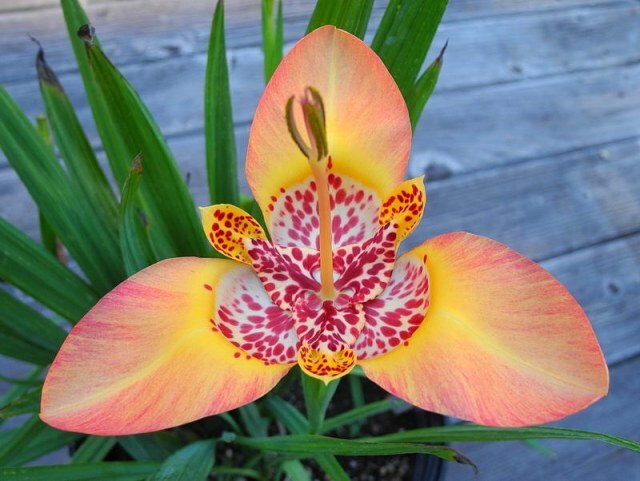 Named variants: Tigridia pavonia 'Sunset in Oz' was a selection made by Ellen Hornig from a chance seedling that appeared at Seneca Hill Perennials in Oswego, NY. It is sometimes referred to locally as "Oz", famous for its beautiful sunsets over Lake Ontario. Photo 1 is 'Sunset in Oz'. 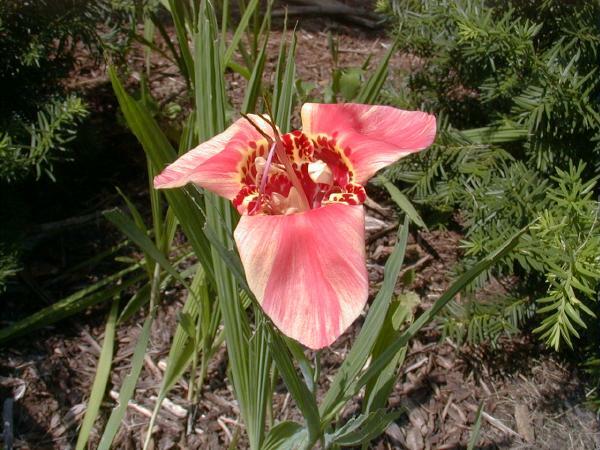 Photo 2 is a seedling from 'Sunset in Oz' which according to Ellen that "for shear screaming flower-power it's hard to beat.". 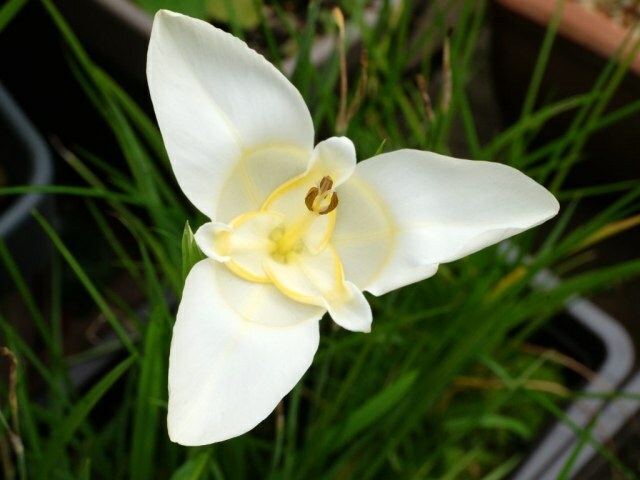 Picture 3 by Martin Bohnet shows the cultivar 'Alba Immaculata', a somewhat misleading name since the former Rigidella immaculata was moved to Tigridia immaculata, which of course is a totally different species. 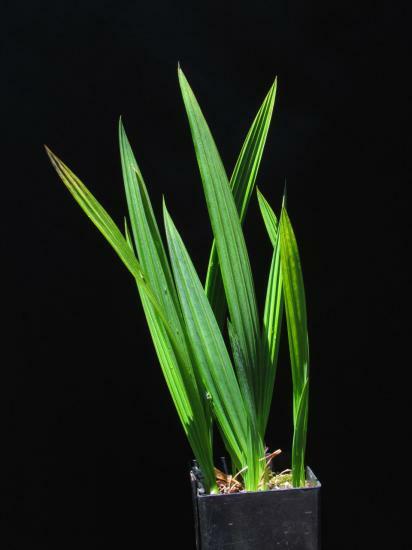 'Alba immaculata' is stable from seeds if selfed. 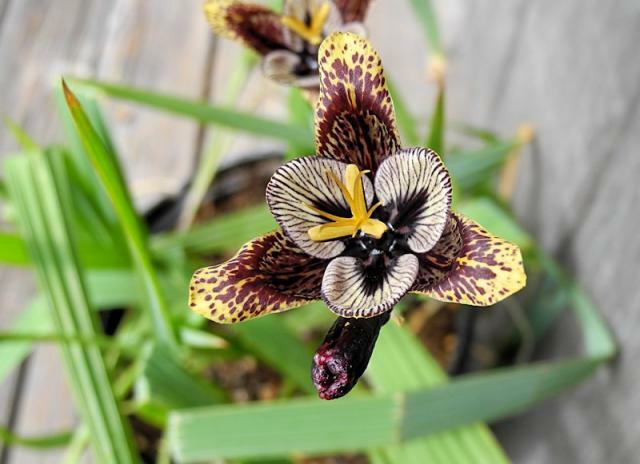 Mary Sue Ittner received seeds from a seed exchange from 'Sunset in Oz' and even though she has found it challenging to grow this species in her relatively cool summers decided to see what the seedlings might look like. Seed was started February 22 and seedlings started emerging on April 15. The first flowers appeared in September. There were 5 different flowers each lasting one day. 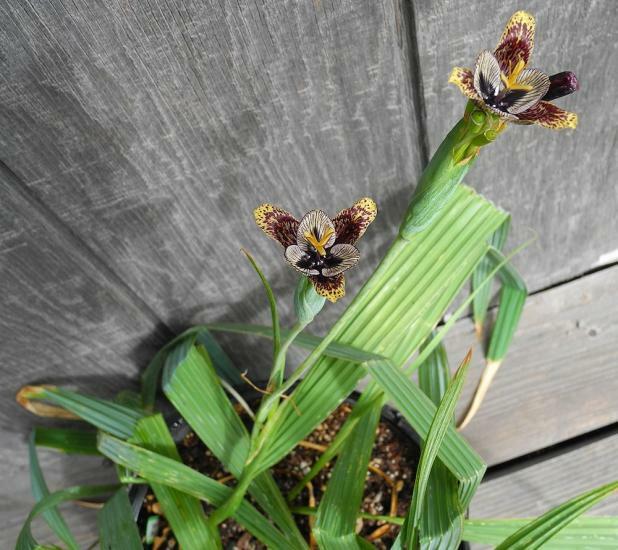 In October there were two more blooms, possibly repeats from some of the other bulbs. The next year there was only one flower one day, but this one was totally different and it happened to flower on her husband's birthday. 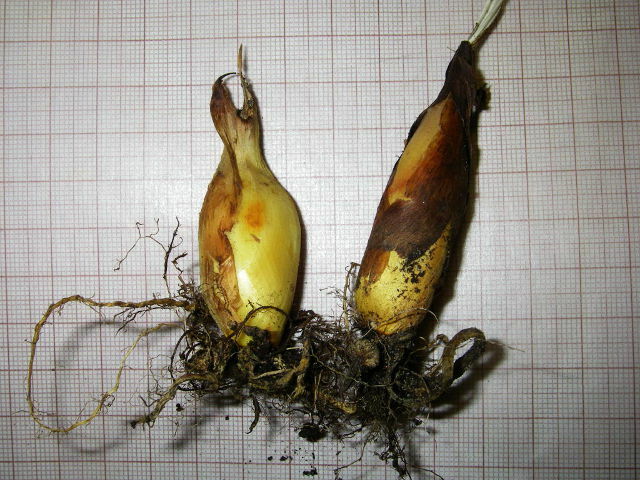 The last photo shows a couple of bulbs in the third year. Photos 1-2 taken by Rob Hamilton show a yellow form (selfing) and a tangerine (selfing) from a batch of seedlings. Photo 3 shows a pink/red form photographed by Jim McKenney in his garden on August 10, 2005. 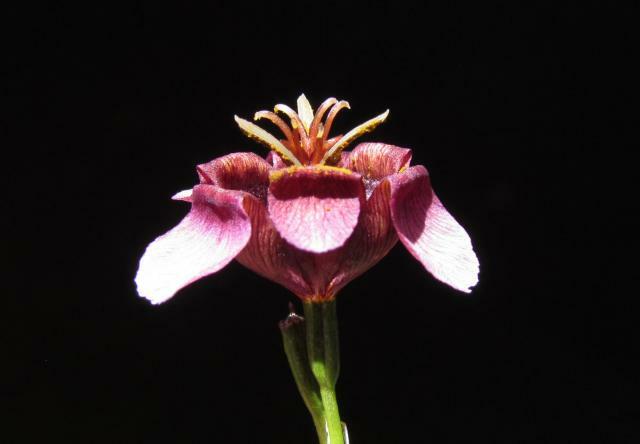 The flower began to open between 6:30AM and 7AM and began to close at around 4PM. Photo 4 was taken by Paul Tyerman and photo 5 by Bob Rutemoeller. 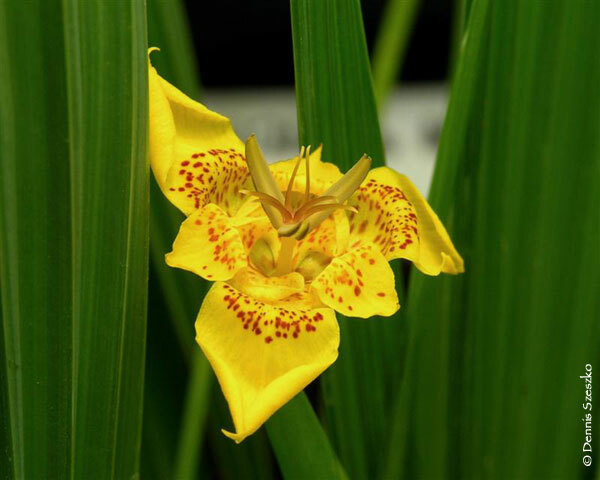 Photo 6 was taken by Dennis Kramb in Cincinnati, Ohio of a plant from Brent & Becky's Bulb Company. 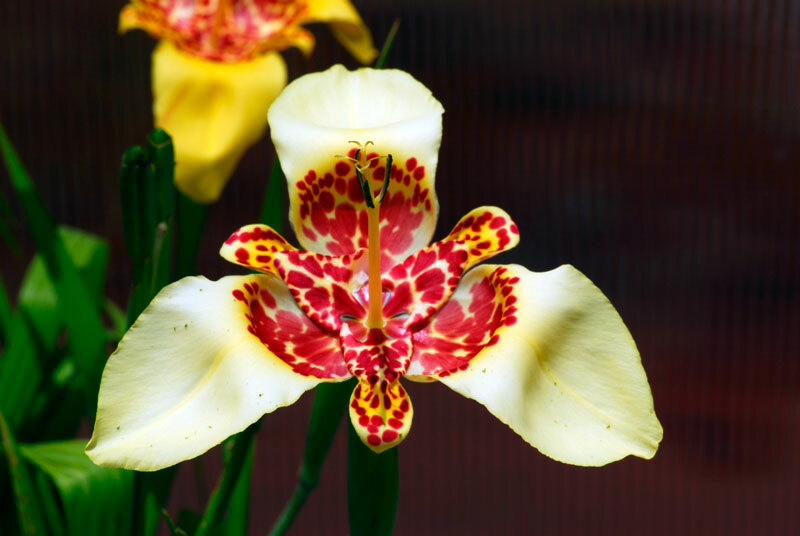 The photos below is of a nice form grown from seeds by Nhu Nguyen. 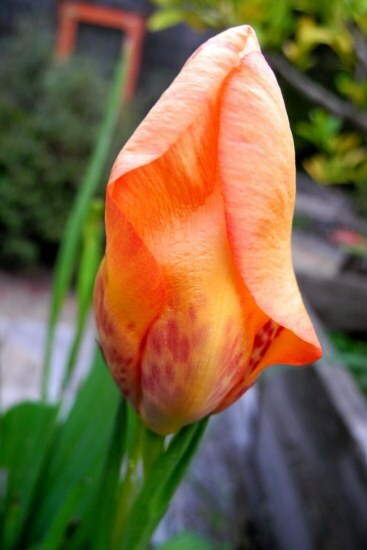 Because of the cool summers in the Bay Area, it took 3 years for this one to bloom from seeds. The photos below were taken by Nhu Nguyen of an outstanding example of how to combine summer dormant and summer growing bulbs together. 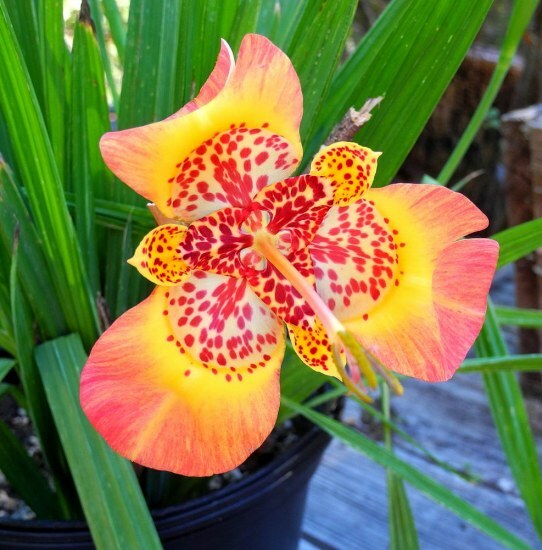 It features Amaryllis belladonna, which is summer-dormant but benefits from watering and Tigridia pavonia which requires summer water. 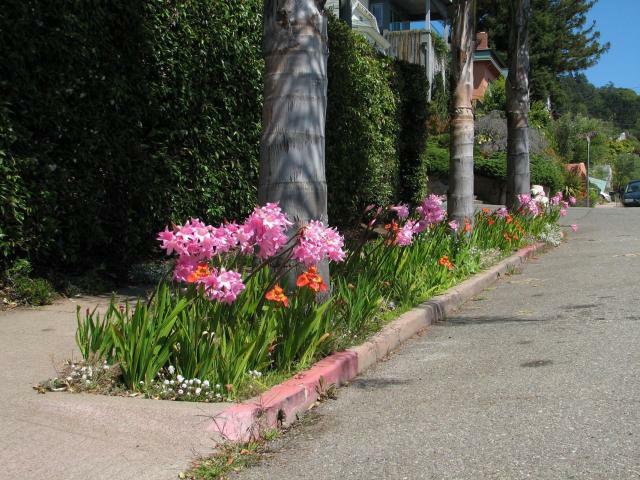 This landscape is found in the Hills of Berkeley, CA by an unknown (and obviously knowledgeable) landscaper! 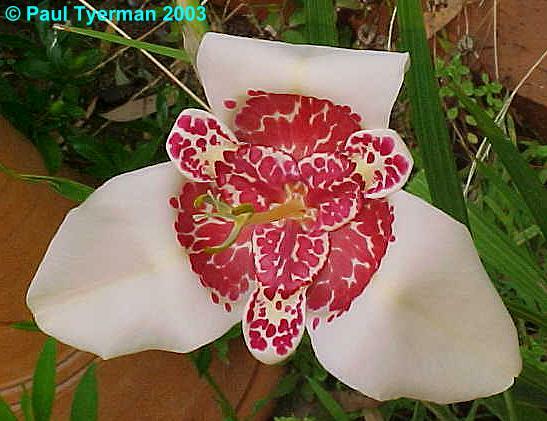 Tigridia tepoxtlana Ravenna is a small, white flowered species native to Morelos State, Mexico. 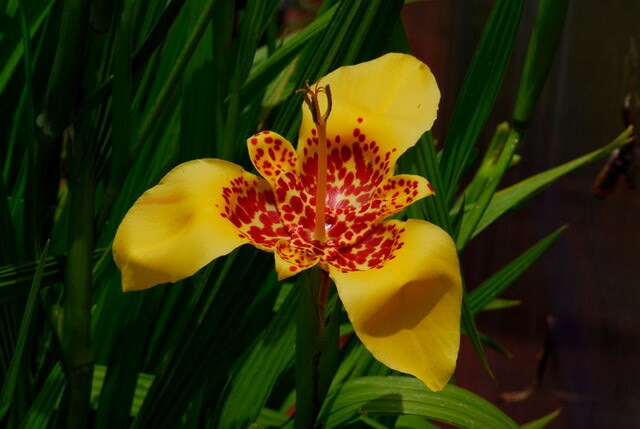 This Tigridia unknown South-American species is from Lima, it hasn't been classified correctly. It has only been reported to grow in "lomas" of Lima, an ecosystem characteristic for being dry for 6 months (summer), and wet & covered by vegetation the other 6 (winter). 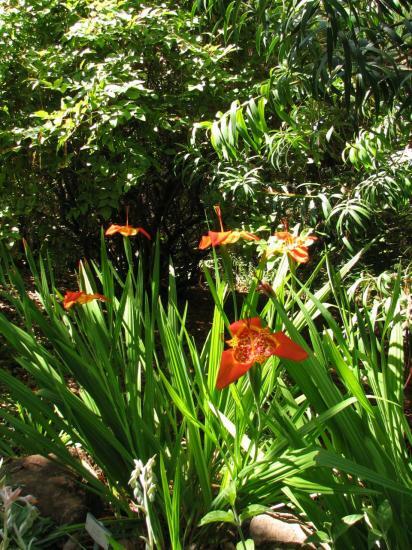 The leaves start growing in June, the flowers appear from August to October, and seeds can be collected from October to November. Pollinators include flies and Pesis wasps also called Tarantula Hawk. 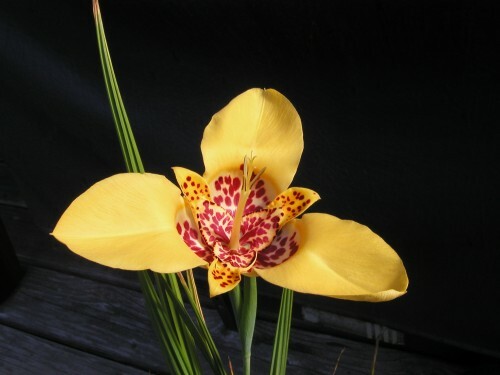 The flower shows similarities with the South-American Tigridia phillippiana, Tigridia albicans or Tigridia arequipensis and may either be one of those or related. All South-American species are discussed to be transferred to Mastigostyla, as phylogenetic studies indicated them to be closer to that genus. Photos from Norton Cuba Melly. Tigridia vanhouttei ssp. vanhouttei is native to Guanajuato, Michoacan, Hidalgo, Morelos, Puebla and Mexico State. 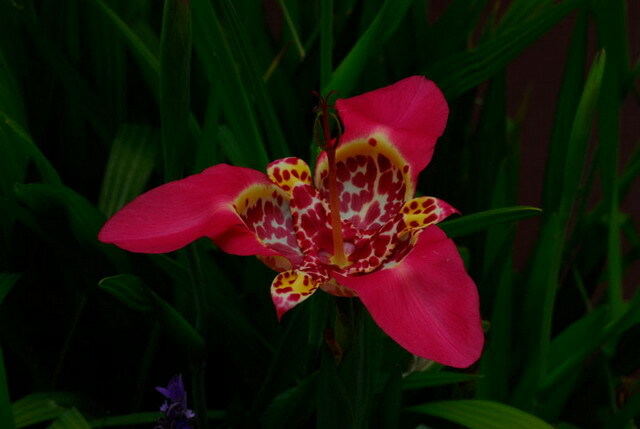 This Tigridia species is widely distributed in Mexico, but rare at all localities in its distribution range. 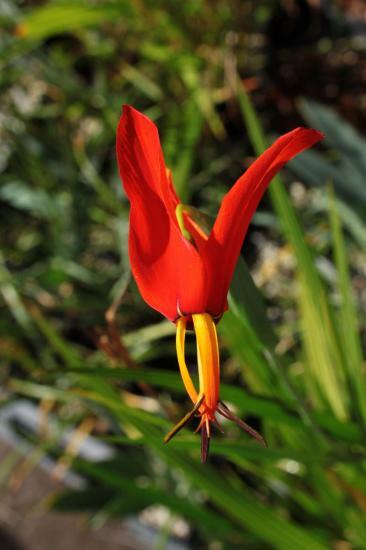 It can be found at high elevations between 2250-2850 meters above sea level. It grows best in gravelly, rocky soils but can also be found in dry scrub-brush, stunted Quercus forest, open fields and along roadside cuts. 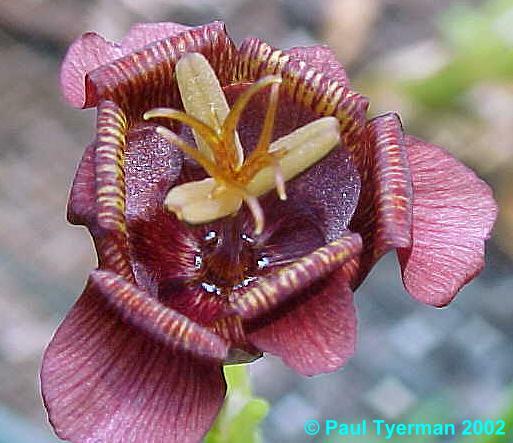 The flowers have a distinctive yeasty, mushroom smell that is produced to attract its insect pollinator. (Some PBS members liken the smell to that of an old tennis shoe cooked slowly over an open fire; it may be that the smell of the species varies from plant to plant, or from grower to grower as some growers report that there is only a very faint smell detected only at very close range.) 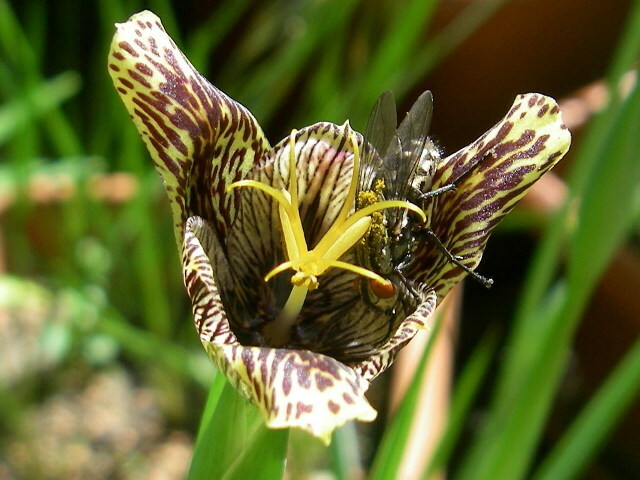 It is likely, although unproven, that this particular species of Tigridia is pollinated by Dipterids as opposed to Hymenopterids owing to the coloration and fragrance of the flowers. This subspecies is easily distinguished from Tigridia vanhouttei ssp. 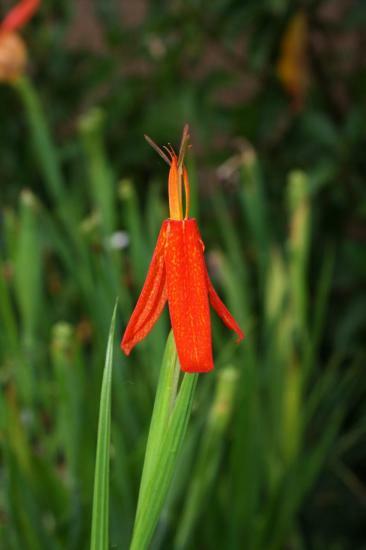 roldanii because it holds its flowers erect whereas the latter has pendulous flowers. T. vanhouttei ssp. 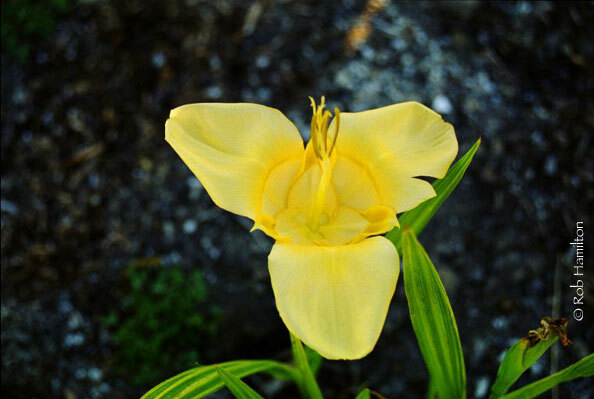 roldanii is extremely rare and known only from two localities in Hidalgo state. 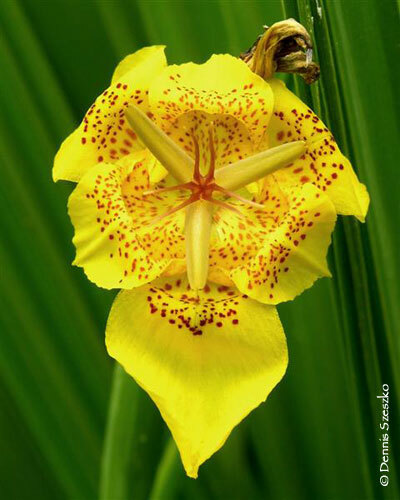 Subspecies roldanii is considered by the Mexican government to be an endangered species. The following pictures were taken in September in Texcoco district, Mexico State at 2600 meters. Photos by Dennis Szeszko. Photo 1 by Paul Tyerman. 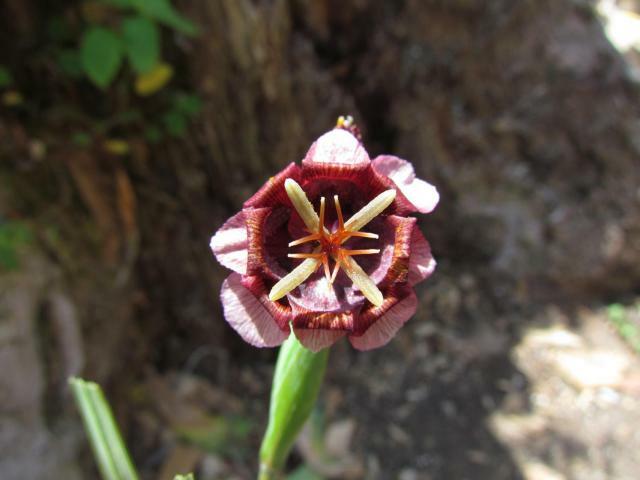 Photos 2-4 were taken by Mary Sue Ittner of plants she grew from seed. Photos 5-6 by Martin Bohnet show a fly from the Calliphora family to be an effective pollinator on a plant cultivated in Europe and flowering size bulbs during dry winter storage.